Do you need to get bail and don’t know about the bail bond process? Read what you need to know to get bail bond, and get someone out of jail. Bail bonds are basically money you hand over to the court system to get out of jail. The money represents your promise that you will return for all hearings and trial. Per Wikipedia, “Bail is a set of pre-trial restrictions that are imposed on a suspect to ensure that they comply with the judicial process. Bail is the conditional release of a defendant with the promise to appear in court when required. “1 Bail bonds are a part of the overall arrest process in Georgia. The first thing to know is that there is no guarantee, or Constitutional Right to be granted bail. In fact, the State of Georgia enacted a law for more than 20 criminal offenses for which bail will not be granted. For charges where bail is permissible, the amount is determined by the governing court (judge). For some crimes, such as a simple DUI without other charges, the court system may have a preset amount of bail. This reduces burdens on the court system and allows people to get out of jail faster. For more serious offenses the person arrested will be held for an arraignment hearing. This is a brief court appearance where a judge will address the charges and listen to a brief response to questions. At this time the judge will announce either denial of bail or the amount of bail required to get out of jail. Anyone over the age of 18 can post bail for an arrested person. Usually, bail bonds are posted by someone close to the person arrested (relative, friend, etc.). A person who wants to post bond must “put up” the full amount set by the presiding judge or court system. Although some people can come up with the money on their own most people enlist the aid of a licensed bail bondsman. What is a Bail Bonds Company or Bondsman? Signature Bond: Also known as being “released on own recognizance”. The court carefully scrutinizes the charges and details of the matter to consider granting or denying this option. 2. Cash Bond: This is the common and quickest way to get out of jail. The accused can immediately post the entire amount of the bond using cash, credit cards or certified funds. 3. Surety Bond: The accused can work with a bail bondsman from jail or call someone else to act on their behalf. There are usually extra fees for administrative and court costs and sometimes county or city fees. 4. Property Bond: In Georgia, a person can leverage the equity in their property to pay for bail, however, the amount of equity must exceed the value of the bail bond. If you need a bail bonds company you can simply do a Google search and find a number of bondsmen in your area. How Can You Pay the Bail Bond Fee? It is completely legal for a person to pay their own bail. The challenge is that the person arrested must have the full amount of bail when they are booked into jail. A huge issue is that these days, if you are carrying large amounts of cash, it will probably be confiscated by the police. Unfortunately, the police automatically assume that you are up to no good if you are carrying large sums of cash. In most cases, the arrested person does not pay their own bail. What If You Can’t Make Bail? More than likely you may be out of jail in 2-4 working days for charges like shoplifting. For very serious crimes a judge may deny the ability to post bail. If you are stuck in jail because you cannot make bail, on a relatively small charge, your trial date should be set within 30 days of the arraignment hearing. Obviously, trials for major crimes such as murder may take much longer to schedule due to criminal defense lawyers requesting more time to prepare their case. If the accused does not show up for court there are swift consequences. The Judicial Council of Georgia clearly states, “If you miss your court date, a bench warrant may be issued for your arrest, and you could be arrested. If you are charged with a traffic case and miss your court date, not only could you be arrested, but your privilege to drive in the State of Georgia could also be suspended.”5 Additionally, the court will seize (keep) the entire bond amount posted. This makes the person who arranged for bond legally responsible to pay the full amount to the bonding company. In these situations, the accused will be hunted by law enforcement and bounty hunters hired by the bonding company. Once arrested, the accused will almost certainly not be allowed to post bail. The accused will then be facing the original criminal charges, new criminal charges, and a very upset judge. If the person who arranged bond used their house or car for collateral they may lose their property. If you or someone you know has been arrested you should contact a defense lawyer along with a bail bondsman. As your lawyer we will represent you at hearings, fight for dismissal or reduction of charges. If necessary, the lawyers at Grisham & Poole can also provide expert representation at trial. Grisham & Poole, P.C. is a law firm located in Canton, Georgia. Our Cherokee County law firm specializes in matters of criminal defense, divorce and family law. Our lawyers are skilled at managing cases requiring litigation, mediation, negotiation, and trial representation. We are client focused. We understand concerns for receiving prompt answers to questions, timely updates on your case, and controlling legal fees. We will provide you with active communication on the progress and critical details of your case. We send detailed billing statements, and offer convenient payment options. 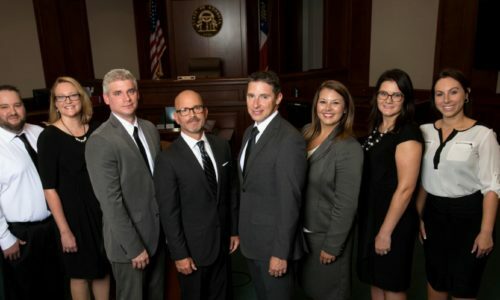 Our lawyers represent clients primarily in Cherokee and Pickens counties. We also work in nearby counties of Bartow, Cobb, Dawson, Fannin, Floyd, Forsyth, Fulton, Gilmer, Gordon, and Lumpkin.